(Richmond, VA – AP) — A second woman has come forward to accuse Virginia Lt. Gov. 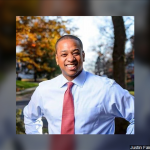 Justin Fairfax of sexual assault. The woman said in a statement Friday that the attack took place when she and Fairfax were students at Duke University. The new accusation further clouds the fate of Virginia’s government. Fairfax would take over if Gov. Ralph Northam were to resign over the racist photo that appeared on his medical school yearbook page. In a statement, Fairfax says the allegation is unsubstantiated and demonstrably false, and he says he has never forced himself on anyone ever.